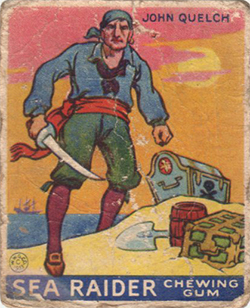 The 1933 World Wide gum issue of Sea Raiders captures various pirates and pirate adventures! The set contains 48 cards with the high numbers 25-48 being scarce. Card numbers 1-24 carry either a Boston or Montreal copyright on the back while cards 25-48 carry the Montreal copyright. The high numbers can also be found with English, French, or Bilingual text. 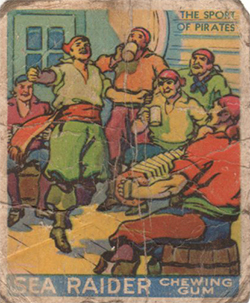 The cards have color drawings on the front of pirate adventures and the backs contain descriptive text. Famous pirates in this set include Capt. Teach (Blackbeard), Captain Kidd, Sir Francis Drake, Sir Henry Morgan, and many others. The cards measure approximately 2-3/8" by 2-7/8" in size.